The Montagnes started training in March of 2010. They went to pre-test for black in August 2015, and returned in December to test. They have both made it though quite a journey, both in their personal lives and in their lives at the school. They are excellent leaders and have contributed a lot to the school. I began my martial arts training at the age of 42. We moved to Wimberley Texas a few months before and my wife said she was going to sign the kids up for karate. “Great!” I said, they can learn to defend themselves, a good skill to have as a kid. My wife came back from the first lesson and said that she was signing up too. “Great...” I thought. It didn’t seem like a good idea to let my wife learn karate without me, so I said that I would join too. I needed some exercise for my chronically sore back and it would give us a family activity we could do together for a while. I was not expecting much, I just needed some exercise. My new job was not as active as my old one, and I could see that I was going to need to get some physical activity. Besides, three hours a week didn’t seem like too big of a commitment. So we started to attend classes, I would run home after work, grab my uniform, and the family and off we went to karate. Pretty basic stuff really; a few blocks, a few kicks, and a few stances. But what was this Dojang Hun? Well it’s just words, let’s go along with it, seems pretty minor. What I really feel silly doing is that Kibon Hyung Il Joel. Makes me feel so uncoordinated, and for something so simple, it sure is hard to remember what to do next. I feel sorry for the people in the front of the class, they have to remember all of that Korean, and all of those forms ... wow that’s a lot of forms. I’ll probably stick around for a few belts, learn a few things, and move on when my family gets tired of this. Thank goodness that exam is over. I passed, but I’m not sure how. I looked like a zombie lurching around out there. Darn Kibon Hyung Sam Joel! You have to change stances in that one. Who can remember that? Now we all get to wear orange belts. Still the lowest in the class, but hey, the kids looked great and are learning some skills. At five and seven they sure look cute in their Doboks. My wife is really enjoying it too. Going to have to keep her happy or I’ll be looking at the wrong end of a Doul Ryo Chaki. Truth is I feel pretty good. My back doesn’t hurt like it did when we moved here. Probably because I’m less active in my job. The Dojang Hun doesn’t seem quite as weird, but I do not like Palgue Il Jang. Providence is what they say it means, but it just doesn’t feel right. I think I finally realized how to count to ten in Korean! Nam! learn as yellow belts? Four, counting Jang Bong Hyung Yi Joel. That’s 10 forms counting the Bong Hyungs! I don’t know how I’ll keep them straight. I like watching the kids, they get it so fast. The instructor is going to have to show me this a million times. I feel pretty good about them once I learn them though. Starting to really challenge me. I’m glad there are still so many people in front of me, at least I will not have to lead the Dojang Hun. Good thing it is written on a sign on the side of the school or I would never remember it. I do feel stronger and my back doesn’t hurt me anymore. That desk job sure has saved me. That test was hard. Kids flew through it though, and both got stripes for doing so well. Wife got one too. Better keep away from her. I am actually starting to feel like I know what I’m doing. I’ve seen the confidence grow in my family, they all make me proud. I truly enjoy coming to karate with them. I see that they are all gaining the ability to defend themselves. As a father and husband, this makes me feel much more confident in their abilities and safety when I am not around. I do have to travel more with this job lately, but I now have something to do in my hotel room at night. I can’t even feel my back hurting anymore. Four new forms at this belt plus another staff form. I can’t wait to try them, but Pyung Ahn Sah Dan looks pretty difficult. I think the formal three steps are pretty cool. One of our brown belts went to Houston to test for black belt this weekend, and I was asked to lead class? Really? Me? I will do my best Gho Sa Nim Ke! The whole family did very well on our tests, all earning stripes. Watching my family continue to grow in Chayon Ryu makes me feel very satisfied. We have done something right joining this particular system. Both our bodies and spirits are growing stronger and more confident. Unfortunately, my wife has developed some health issues that require her to take a break from Chayon Ryu. My daughter wants to take a break while her mother is not coming. We slow down a little, sometimes my son and I go once or twice a week. Sometimes less when I travel. We will be patient, and wait for the girls to come back before we get serious again. Funny that my back is hurting again now that I’m practicing less. I do enjoy Pyung Ahn Oh Dan. Finally a form without H pattern! Looks like the girls will return soon. more challenging but we eagerly await the opportunity to learn the next. We are now Jo Kyo Nims. 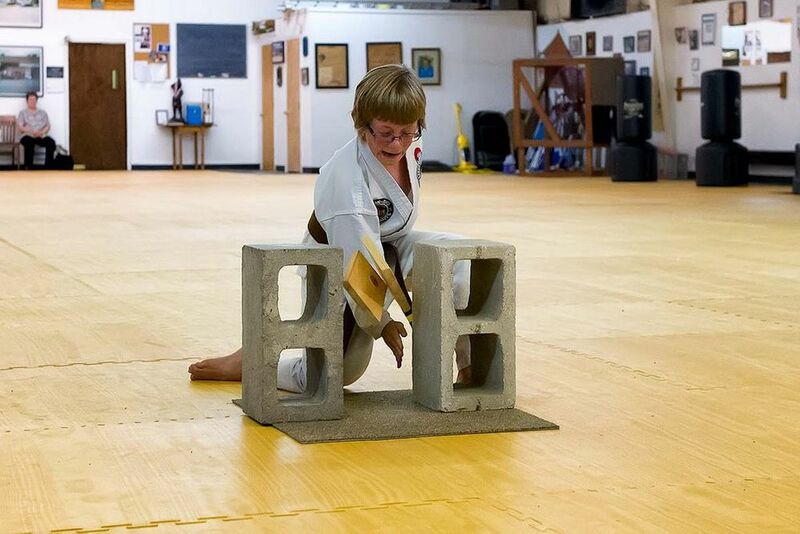 My son and I really enjoy helping others learn Chayon Ryu. Watching my son grow into the young man that he is and have the confidence to stand in front of other people, both children and adults, and lead them through an exercise is very satisfying. Unfortunately, my wife feels that martial arts is too much for her body at this time and she and my daughter decide to stop learning Chayon Ryo for now. They may come back some day. Chayon Ryu has healed my back. All of the forms are so different now. My favorite is Bal Sai Te. We have experienced a traumatic event at our Dojang and the school closes down. We don’t really know what to do. We no longer have an head instructor, or a place to train. There are many of us that do not accept that our training is over. Some of us try to train in the next closest Chayon Ryu dojang. It is just far enough away that it is not a real option for many of us. We have been knocked down. We band together and stand back up. That instructor was not the school, we are the school. Chayon Ryu has taught us all to be instructors. We have heard about Chongjae Nim “chasing the Dojang” under Grandmaster Park, Chol Hee. The place did not matter, it is what we learn and teach. This experience has helped develop our Kong and we now know this. Seven times down, eight times up really means something to us. We continue our training now stronger and wiser. I will have to let you know, but I know the journey only begins here. It is not an end point.